MERU, KENYA - AUGUST 22, 2011: Kamau "Kelly" Ng'ang'a, 22, trains with handmade cement weights in the yard of his childhood home while niece Njeri, 4, and nephew Edwin, 8, practice somersaults. 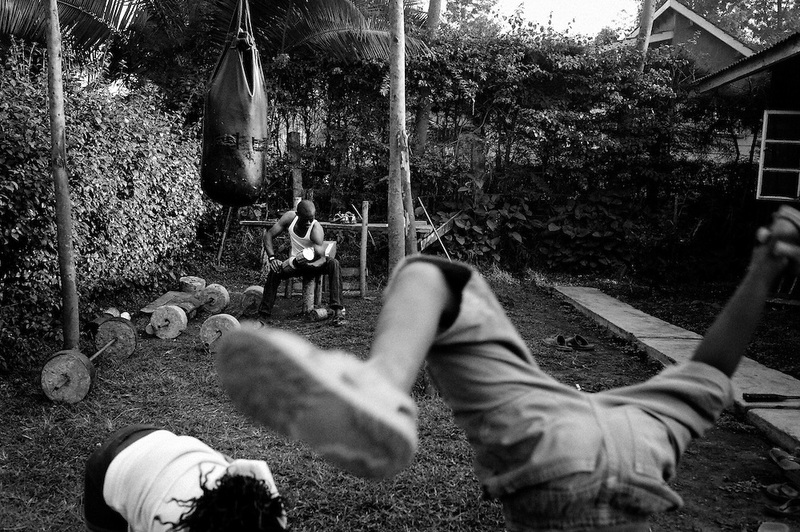 Ng'ang'a built his home training facility by hand in 2010, allowing him to continue training as a boxer while visiting family in Kenya's rural Eastern Province. "I'm young, but with boxing I'm going to succeed in life," Ng'ang'a said. "I need to struggle now when I'm strong so that later on, I'll have time to relax and have a family."